We entered the woods giggling and chattering following a stomach-churning bus ride down the steep, narrow, winding Muir Woods Road in Marin County, California. Muir Woods was cool and damp, a light fog due to the tall tree coverage and a creek running through the forest. The redwoods stood tall and proud above us, none of my group above 5’8”. We felt like ants with the towering woods around us. It was a comfortable temperature, warm enough not to need a sweatshirt even in the shade; much warmer than our New Hampshire home at the end of a cold, rainy April. These woods felt the most like home of anywhere on our tour of San Francisco. Three thousand, two hundred and nineteen miles away, and little things reminded us of home. The trees themselves taught us about friendship and support in hard times, whispering their lessons as we walked through these woods. Redwood trees support each other in times of trouble; when there is damage to the base of a tree, any surrounding trees will lean over and provide physical support and extra nutrients to the damaged areas. Throughout our five days in San Francisco, my group found ourselves doing the same for each other, with bus ride talks and good-night hugs. Our little family of juniors and seniors were like the trees; some of us feeling a little broken inside, one of us sick, some a bit burned out. Those of us still standing tall supported each other, lending a helping hand, an endless supply of Kleenex, and some extra snacks like the trusty old redwoods and their sharing roots. We sat for a few minutes by the beautiful creek, feet dangling over the calm water, staring up through the seemingly never-ending trees, breathing in the pure air. Any shred of anxiety and doubt washed away, negativity and carbon dioxide released together in every exhale. Muir Woods could heal the whole world of hurt. There is a beautiful section of these woods, Cathedral Grove, that asks for pure silence and appreciation of the beauty of the woods and their meaning. The woods sing to the attentive listener, with the sounds of the creek bubbling over roots and rocks, different species of birds happily chirping away, the soft murmurs of voices many feet above on a walking trail in the hillside, barely audible. When one is in Muir Woods, silence in Cathedral Grove is a necessity. Walk a few feet away from your group, and just listen and appreciate. Read the signs; take in every bit of information from every sense. Hear the birds, feel the cool air, see the red and green of the hardy woods and sun peeking through the canopy. Feel pure in these woods. Our tour was with a music group, thirty members of the performing arts department, the majority in chorus. My group in the grove below could hear a few sweet notes floating through the air as they passed over us on a hillside trail, singing “Now Touch The Air”; a perfect fit for the pure air and the magic of the woods. 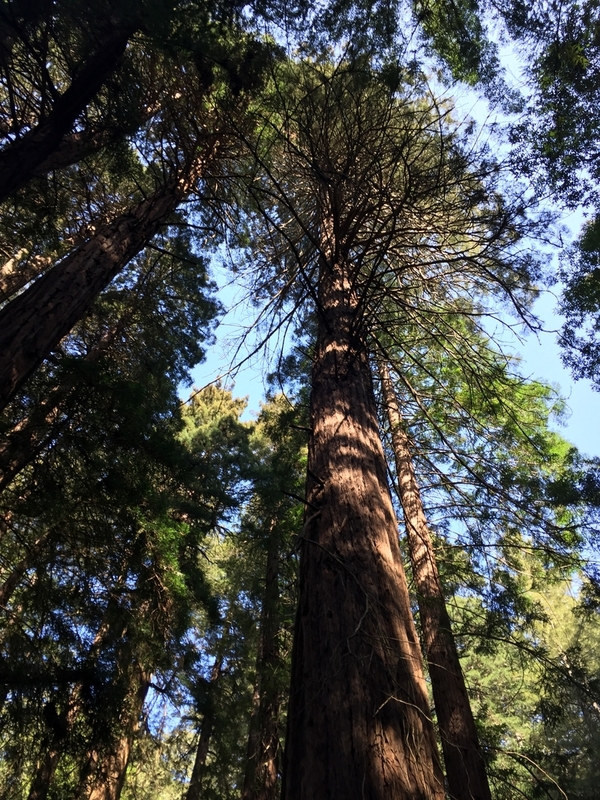 Listening was my favorite sense of Muir Woods. We left the woods at peace.